Hindus across the country are gearing up to celebrate Basant Panchami on 22nd January 2018. The word‘Basant’ means spring and ‘Panchmi’ denotes the fifth day of the “Maagh” month of Hindu calendar. Basant Panchami is also celebrated as ‘Saraswati Puja’ in many communities. Children are introduced to reading and writing on this auspicious day. It is considered as a blessed beginning of learning with the goddess of knowledge and wisdom- Saraswati. The festival that marks the onset of spring is celebrated with many motifs characteristic to spring. People deck up in colourful clothes and relish in seasonal foods. Many communities fly kites and play various games. The colour yellow holds a deep significance in the festival. The color of Basant (Spring) is yellow, also known as the ‘Basanti’ colour. It symbolizes prosperity, light, energy and optimism. This is the reason why people wear yellow clothes and make traditional delicacies in yellow hues. Here are 4 yellow coloured traditional dishes you could celebrate Basant Panchami 2018 with. Meethe Chawal is prepared in Punjabi households on special occasions, however the ‘Meethe Chawal’ prepared on Basant Panchami are quite special. Also known as Kesari Chawal, this sweet dish as the name suggests, is made of rice which is sweetened by sugar syrup. The use of aromatic spices like cardamom, cloves, cinnamon and kesarmakes it a treat hard to miss. 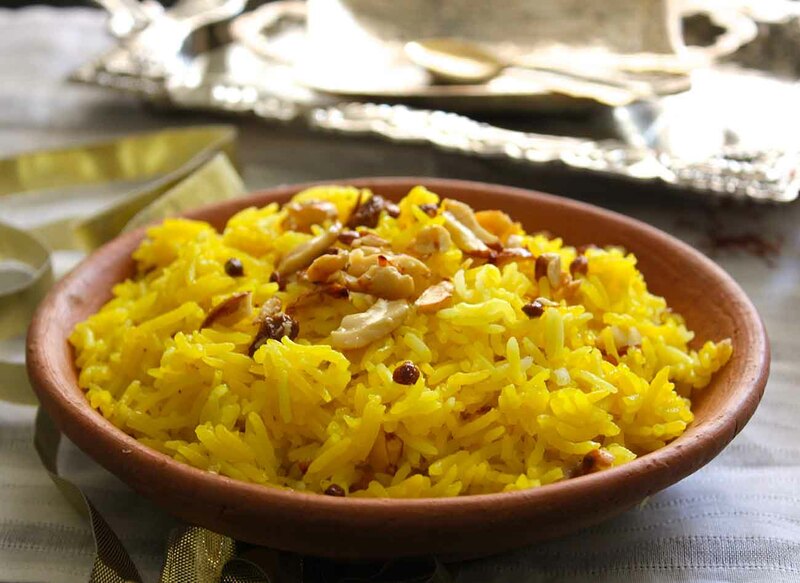 The delightful saffron, in addition to adding the fragrant flavour, also lends a beautiful yellow hue to the rice, making it the perfect festive treat for Basant Panchami. 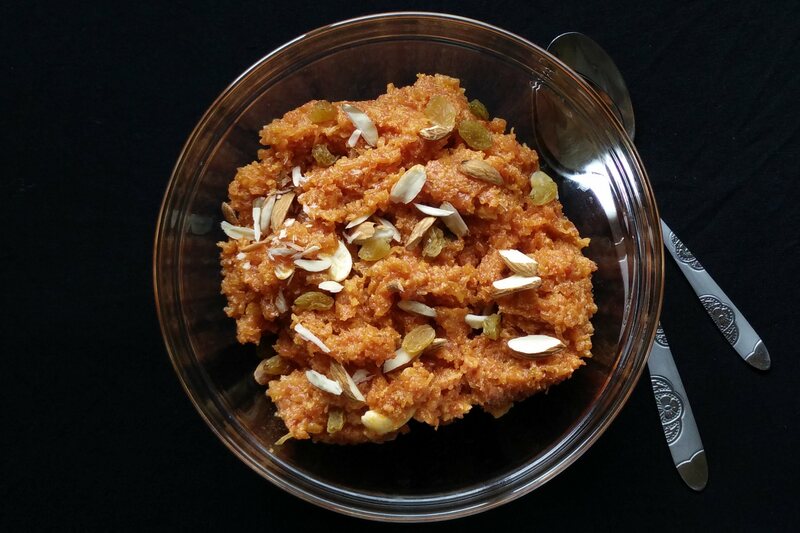 A rich semolina and milk based sweet dish prepared in Maharashtrian or Gujarati households during Basant Panchami. The sweet treat is loaded with chunky nuts like almonds and cashews and flavoured with aromatic tinge of saffron and cardamom. 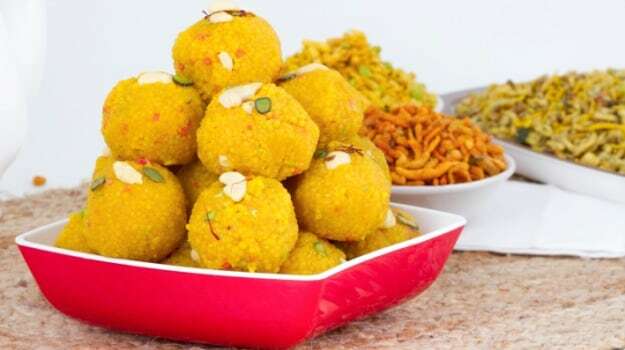 Boondi ladoo is every Indian’s go-to sweet for any auspicious occasion or pooja and Basant Panchami is no exception. But in this case, the association is definitely more special. Why, you ask? Because of its lovely yellowish orange colour, that is perfectly in tune with the festive spirit of Basant Panchami. Boondi ladoo and Motichoor Laddoo can be easily prepared at home. Boondis are prepared by pouring the besan through a perforated ladle into bubbling hot oil, and deep-fried till crisp. These besan pearl-like droplets are then soaked in sugar syrup and then moulded into ladoos. You can follow this easy recipe to get the delight right in the comforts of your kitchen. Rajbhog is a traditional Bengali sweet made with paneer and stuffed with almonds and pistachios. The spongy treat with a mix of saffron, cardamom powder, almonds and pistachios can be dubbed as a richer and wholesome cousin of Rasgulla. 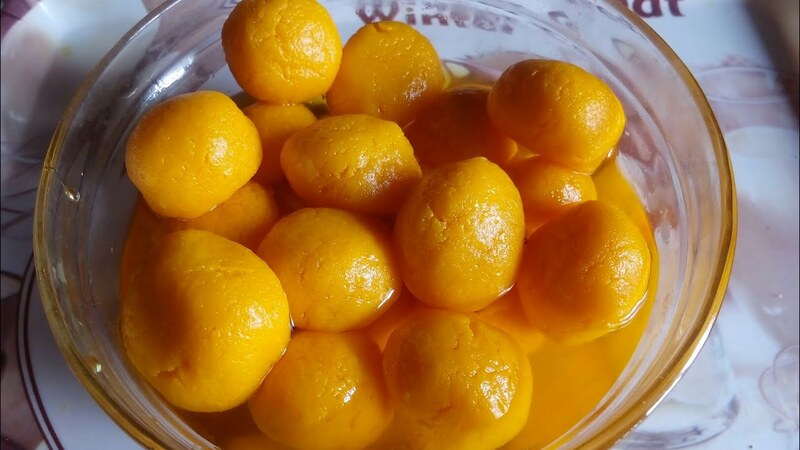 Rajbhog is part of every festive occasion in Bengal, but because of its distinct yellow colour, it makes for a popular treat during Saraswati Puja celebrations.